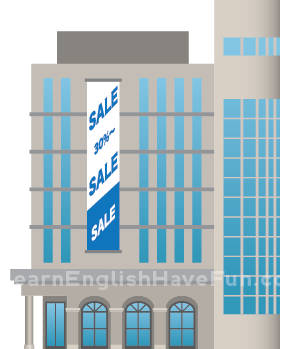 Real estate and other places vocabulary is very basic but often English students don't know all of the words. 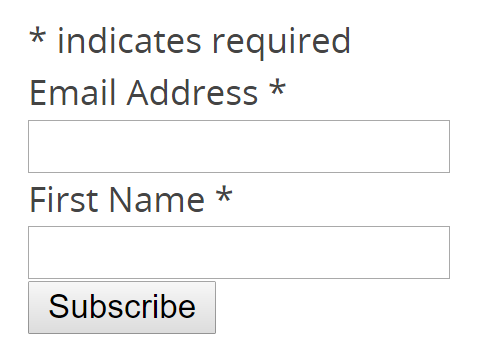 I've tried to include a wide variety of places in this list. 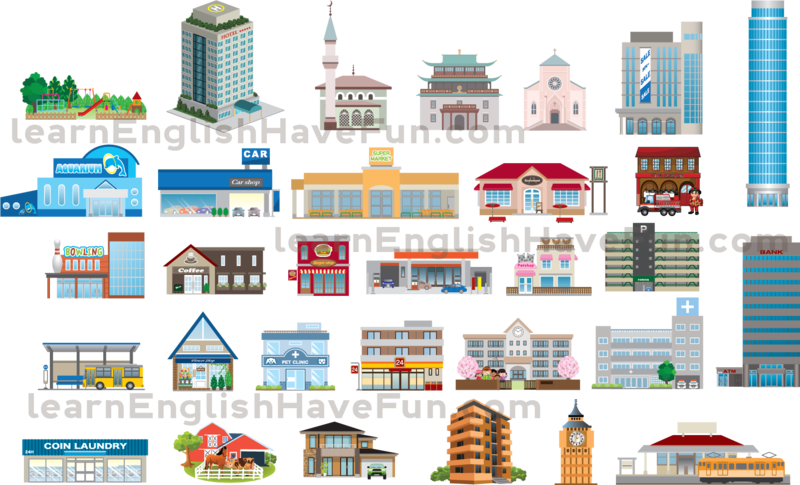 The video let's you hear the names of the places vocabulary words pronounced in American English. There is a pause after each word--that's where you should practice by saying the word out loud yourself. 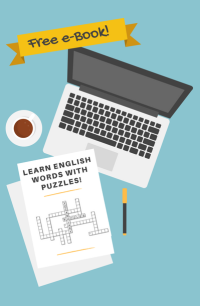 The descriptions below will help you practice your English further. 24-hour mini mart: a small grocery store that is open every hour of the day. 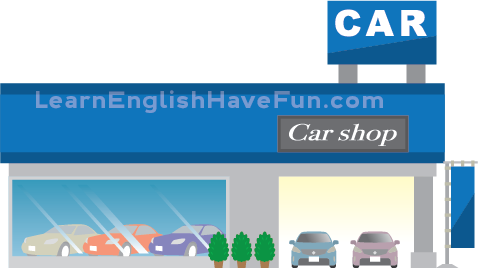 car dealership / garage: a place where you can buy cars and also have them repaired. burger shop / burger joint: a place the sells hamburgers and French fries as the main specialty. A "burger joint" is used in informal American English. clock tower: a tall building with a clock near the top which chimes (makes a sound for each hour at the beginning of each hour of the day). 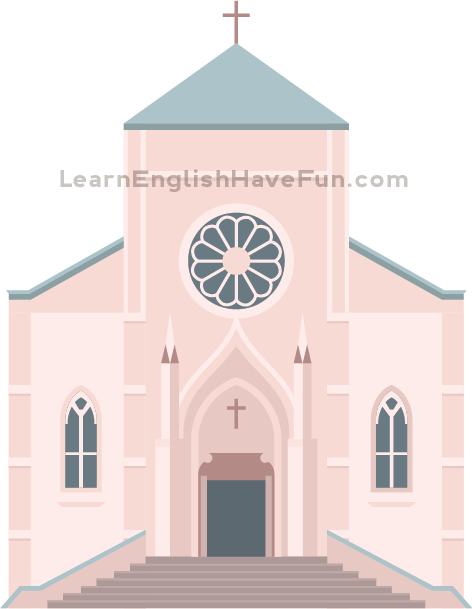 church: a religious place of worship for Christians. bus station: a place where different busses stop and pick-up/drop-off passengers going to different destinations. 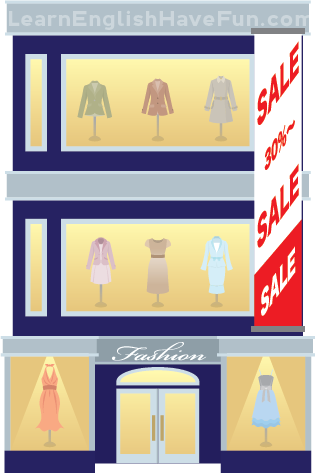 clothing shop / clothing store: a store that sells clothes and/or accessories. 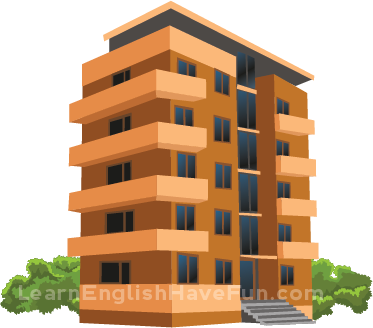 apartment building / apartments: a place that has various individual apartment units for different individuals and families. 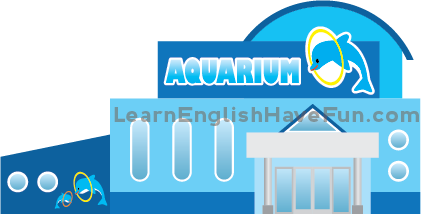 aquarium: a building where people can visit to see animals and plants that live in the water. bank: a business where people keep money, borrow money, etc. ATM teller: (Automatic Teller Machine) a machine that allows customers to automatically access their bank accounts and withdraw or deposit money, pay bills, etc. 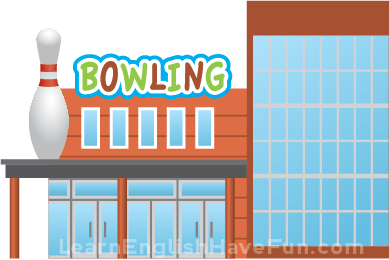 bowling alley: a place where people go to do bowling - a game where players try to knock down bowling pins with a bowling ball to score points. 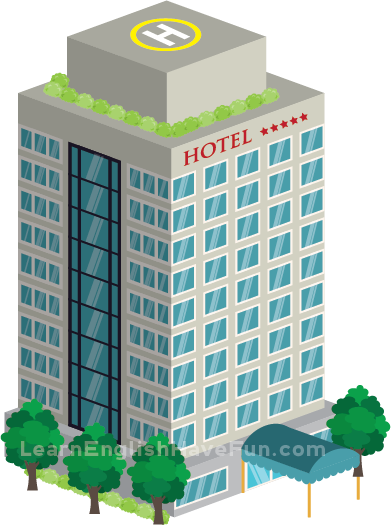 hotel: a building with individual rooms and suites where guests can stay overnight to sleep, eat and bathe. Hotels also frequently have rooms for business meetings and events (e.g., wedding receptions, conferences). coffee house / coffee shop: a place where coffee (and usually other non-alcoholic beverages) are served. Usually light foods (sweet pastries, breads or sandwiches) are also served. 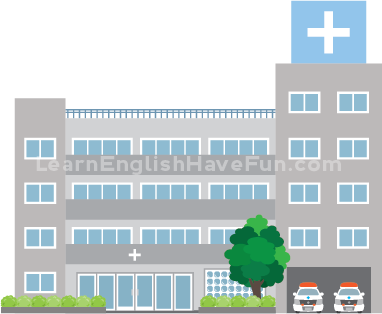 hospital: a place where people go to be treated for illnesses, injuries or health problems and/or have medical tests and procedures to prevent sicknesses. 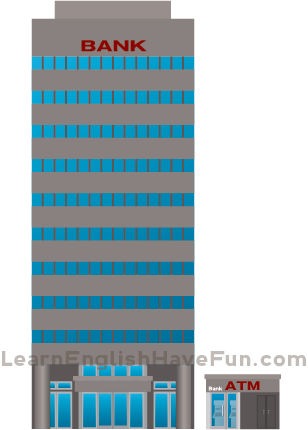 high-rise building: a very tall building such as an apartment building or office building with many floors. High-rises are often buildings that have many different businesses inside the same building (e.g., stores, doctors offices, businesses and apartments). High rises are normally found in city-centers to maximize the small amount of land in the city. grocery store: a place where you can buy food and other supplies. supermarket: a very large store that sells food and other supplies. You can often buy items in "bulk" (a large quantity of the item). gas station: a place where you can buy gas (gasoline). Note: we say "gas" station not "petrol" station in American English. 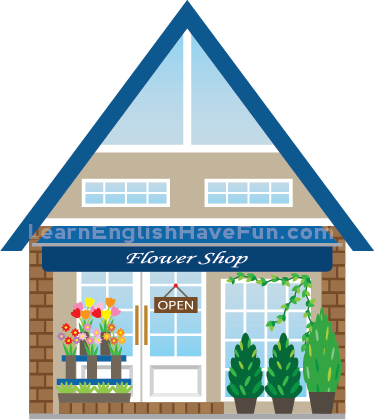 flower shop / florist: A place to purchase flowers and other plants. (Note: a flower shop is a small shop. A "nursery" is a place that sells larger plants like trees and shrubs as well as flowers. 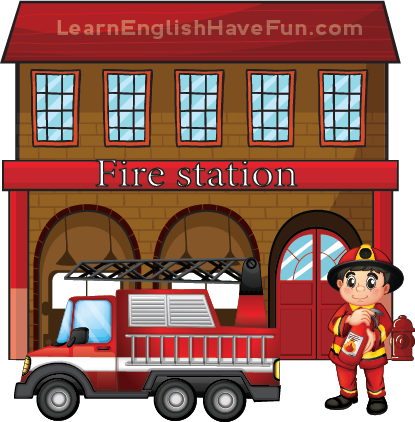 fire station: a place where fire fighters, fire trucks and other equipment are located. 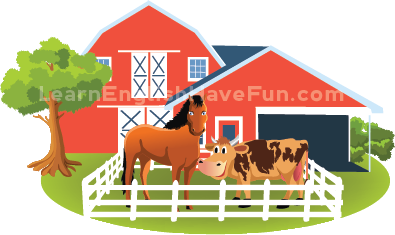 farm: a place with lots of land where animals are raised and crops are grown. department store: a large store that is owned by the same company that has different "departments" selling various types of items (e.g., women's clothing department, men's shoe department, housewares department, lingerie department). (Note: this is different than a shopping mall which has different stores owned by different companies). 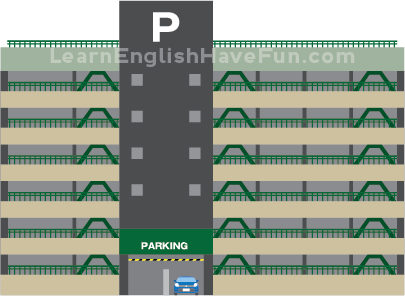 parking garage: a building that has parking spots where drivers pay to keep their car in a parking space/spot. playground: an area for children with equipment they can play or climb on (e.g., swings, slides, jungle gym). school: a building with classrooms where children learn. 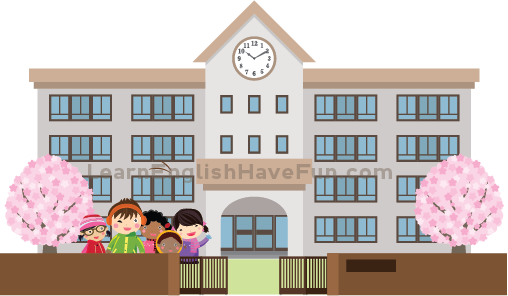 In American English we have: pre-school (<5 years), kindergarten (5 years), elementary school (6 - 11/12 years), middle school (11/12 - 14/15 years) and high school. 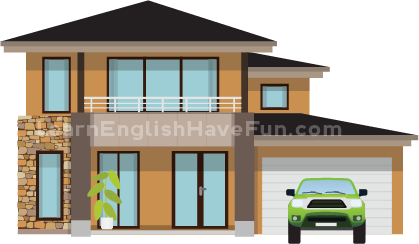 house / single family home: a separate building where one family lives. Usually there is a yard in the front and back and a driveway with a garage for a car(s). laundromat: a place with many different machines (that require coin money) to wash and dry clothes. mosque: A building that is used for Muslim religious services. restaurant: a place where food and drinks are served. 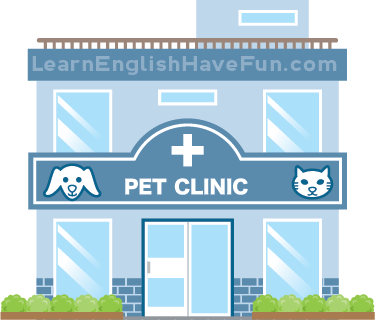 pet clinic / veterinarian's: a hospital or doctor's office for animals (pets). 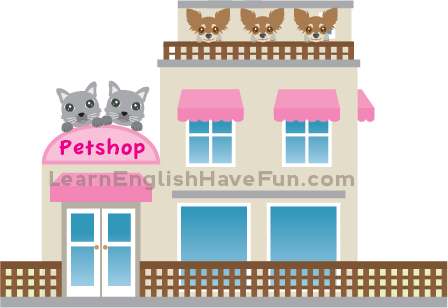 pet shop: a place to buy food and supplies (e.g., toys, beds, clothing, leashes, collars, aquariums) for animals. Many pet shops also sell pets (e.g., fish, rodents, dogs, cats, rabbits, snakes). 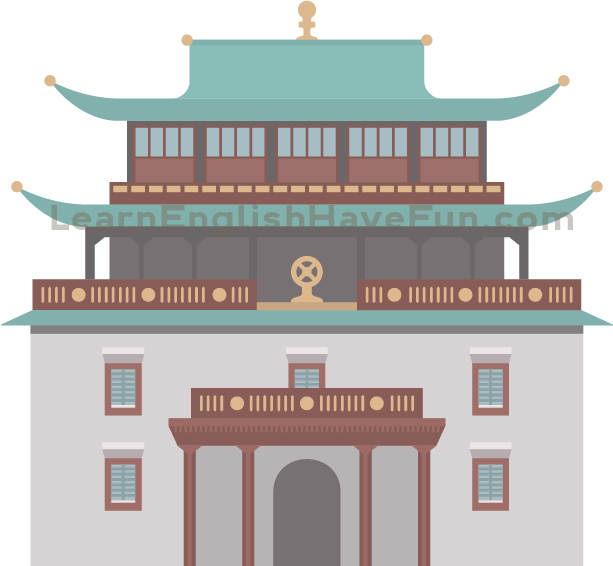 temple: a building for religious services (e.g., Buddhist / Hindu / Mormon / Jewish temples). train station: a place where trains pick-up and drop-off passengers. Which places did you go to today? Do you work at one of these places? Do you live in an apartment or house? Which places have you never been to? These are just some sample questions you could answer to practice these different places vocabulary but you can write about anything you'd like.